d. Are These the Seal 6 & 7 Timelines? History is strewn with false prophet End Time predictions and ALL have failed so you will not find End Time dates or timelines here. This has not kept us from being pummeled daily with a barrage of never-ending doomsday movies, TV programs, internet sites and a vast number of mostly disgusting false prophet (profit) religious evangelists and leaders of different faiths from American Hopi Indians, Christian clergy, Jewish Rabbis, to Islamic Imams proclaiming the end is near. The question is, are we truly? What we were told to look for in the Bible are "The Signs" of the End of Days found in Daniel's Prophecies and the Book of Revelation - some that are clear and others subject to interpretation. There are those that believe that the first 6 Seals have already occurred - likewise, there appears to be a number of these prophecies manifesting - contrived or real - that are explored below and left to the reader to decide for themselves if they match those signs we were warned of. Now IF the first 6 Seals have already occurred, there are very powerful behind-the-scene individuals who are taking great measures to ensure an artificially "re-created" 6 Seal Apocalyptic scenario in order to "force the hand" of the arrival of the Antichrist and/or Messiah while more easily controlling a greatly depopulated world. Ultimately, you be the judge if the unfolding events are matching Biblical prophecy of the End Times. Only you can determine the veracity of any claims posted here or elsewhere - however, keep in mind that ultimately, it doesn't matter if any predictions turn out or not - if the end of the world ends in a cataclysmic event or not - ultimately, its only YOUR End of Days in this world that matters. How you use the time YOU have left from this point forward to get right with your Creator is ultimately how you will be judged. If you are a non-believer of God, you cannot disprove the overwhelming archaeological, prophetic and scientific testimonial evidence that exists that proves the existence of God nor you can you turn a blind eye to how events are unfolding precisely as the prophets Daniel and John of Revelation said they would to the point of being extremely obvious. It's not coincidence but all part of Elohim's master plan for humanity whether you like it or not and scripted since before the beginning of time. the 3 World War agenda to bring about the New World Order was launched since August 15, 1871 by Albert Pike, 33 degree Freemason and self-proclaimed Luciferian. All the key players are conveniently in place in all major countries to make the Masonic Master Plan happen to bring about the New World Order. People foolishly believe their votes count in a rigged system where pre-chosen political puppets of the most degenerate and corrupt background and nature are hand-picked and directed by the "Illuminati" to bring about the NWO supported by treasonous military personnel and police via false wars, false flags operations, ecological disasters that are created then ignored, toxic GMO produce and chemtrails are forced upon a dumbed-down, fluoridated and lethally vaccinated and soon to be depopulated, debt-burdened humanity which can have the 666 Mark of the Beast more easily applied on them (see here). Albert Pike's dream of a New World Order controlled by Luciferian Freemasons is "the Beast" of Revelation. Because it was prophesied to happen in the Bible that has never failed in its prophecies, the Masonic NWO Beast must happen and we are clearly seeing it unfold before our eyes - precisely as scripted. It is recommended you read the chapter "666 Marks of the Beast" (here) which identifies the players of the New World Order agenda. Below you will find what appears to be "the signs" we were warned of nearly 2 millennia ago to look for of the tribulation period before the second arrival of the Messiah. The signs are matching precisely as those foretold by the prophets Daniel, Isaiah in the Old Testament and by John and the Messiah in the New Testament. The Apocalypse is the punishment unto mankind by the Messiah for all those who ignored His Father's Laws. The knowledge and keeping of the Nazarene Code will help you to identify the Beast of Revelation and its marks. You must decide for yourself if in fact we are at the End of Days for humanity - be they or not, Judgment Day is as close for those who died thousands of years ago or for those who die today - it comes the instant we wake from the dormancy of death. NONE of our ancestors are in Heaven now - they are ALL awaiting Judgment. Countdown to the 7th Seal ? 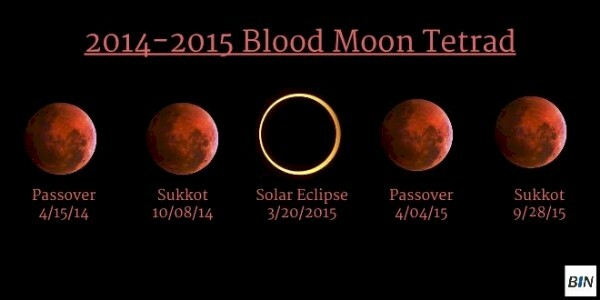 The following clips demonstrate provide an understanding of the Old Testament 7 year Shmita (or "Shemitah") cycle and 7x7 Jubilee "Super Cycle" is not only in effect but is claimed to have begun (read here) in conjunction with the Tetrad Blood Moons which concur during 2014-2015 and concluding sometime between September 2015 and March 2016 at which time Seals 6 and 7 are said will open - ultimately destroying one third of the living creatures and sea as mentioned in the Book of Revelation which appears to be pointing to the Americas where 1/3 of the world's landmass and most of the world's non-Torah practicing Gentile Christian populations reside. The correlation between truly cataclysmic events over the past one hundred years and the dates of the Shemitah are quite remarkable. The preceding graphic portrays the uncanny correspondence since 1990 in a way that is quite telling. 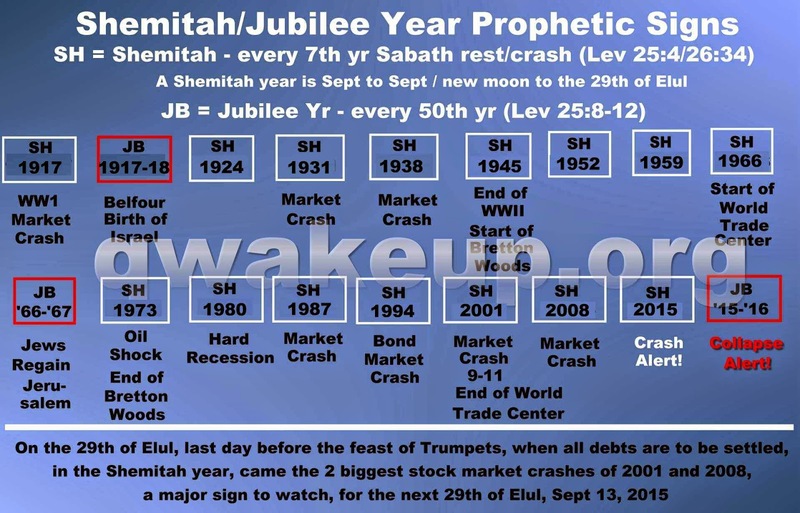 The dot-com bubble burst of 2000 and 2001, the 9/11/01 false flag terrorist attacks, the economic crash of that September in 2001, the stock market crash of 2008 are just a few of those events which occurred during Shemitah*. *The Mystery of the Shemitah… As the prophets gazed out at the ruins of ancient Israel, they realized that there was a mystery to the timing of God’s judgment! That mystery centred on the Biblical Shemitah. Every seventh year, the “Shemitah, or Sabbath Year,” would cause the land to rest, when sowing and reaping, buying and selling would come to a standstill. The Shemitah was unique in that it specifically affected the nation’s economic and financial realms — wiping out all accounts of credit and debt. For the nation that departs from God, the Shemitah becomes a sign of judgment. The year of Shemitah reaches its culmination on the last day of the Hebrew year. The Signs in the Heavens Appear to be Pointing to the End of Days ? As you may have noted, Steve Cioccolanti above makes reference to Gil Broussard whose video "A Summary of Events of Planet 7x" featured below under the header, "Nibiru / Planet X / Hercolobus / Wormwood". The Tetrad ties in directly with the Hebrew calendar and therefore, God the Father's Torah. What this implies is that the Torah ("Law") is very much alive and in effect - it is in fact, the living Word of God - and not "nailed to the cross" as the heretic and false apostle Paul claimed. After you read The Nazarene Code, you will clearly identify the true faith the Messiah intended for us to follow and identify the Mystery harlot religion whose church made up of genocidal, idolotrous, pagan and degenerate pedophiles that preach a heretical, Torah-less (Lawless) gospel of the Pharisee Paul (Sha'ul) that has sprung thousands of illegitimate offspring (churches) worldwide. Are We Witnessing the 7 Seals of The End of Days ? Straight from the script of the Book of Revelation of the 4 Horsemen of the Apocalypse: Conquest/Pestilence, War, Famine and Death are the following natural and man-made disasters that combined imply a very limited time left for most of humanity. Though WW3 has not broken out as of yet but certainly appears to be on the horizon, tensions among the world's powers are growing daily - all in fact part of the Masonic, New World Order agenda to depopulate most of humanity which is why the governments of the world are doing nothing to stop the spread of these natural and man-made disasters. 7When the Lamb broke the fourth seal, I heard the voice of the fourth living creature saying, "Come." 8I looked, and behold, an ashen horse; and he who sat on it had the name Death; and Hades was following with him. Authority was given to them over a fourth of the earth, to kill with sword and with famine and with pestilence and by the wild beasts of the earth. The 4 Videos below explain in detail the effects the Destroyer responsible for Seals 6 and 7 will have on earth. Major Ed Dames, retired U.S. military remote viewer, claims the earth will be struck by a powerful EMP (Electro Magnetic Pulse) from the sun - could this be instead be the debris field or effect of Nibiru? You be the judge. 5And they were not permitted to kill anyone, but to torment for five months; and their torment was like the torment of a scorpion when it stings a man. 6And in those days men will seek death and will not find it; they will long to die, and death flees from them. 7The appearance of the locusts was like horses prepared for battle; and on their heads appeared to be crowns like gold, and their faces were like the faces of men. 8They had hair like the hair of women, and their teeth were like the teeth of lions. 9They had breastplates like breastplates of iron; and the sound of their wings was like the sound of chariots, of many horses rushing to battle. 10They have tails like scorpions, and stings; and in their tails is their power to hurt men for five months. 11They have as king over them, the angel of the abyss; his name in Hebrew is Abaddon, and in the Greek he has the name Apollyon. 12The first woe is past; behold, two woes are still coming after these things. Completely the opposite of scripture stating the Messiah descends from heaven on His return.